Sycamore Canyon is just a bunch of fun. It is by no means a difficult ride. 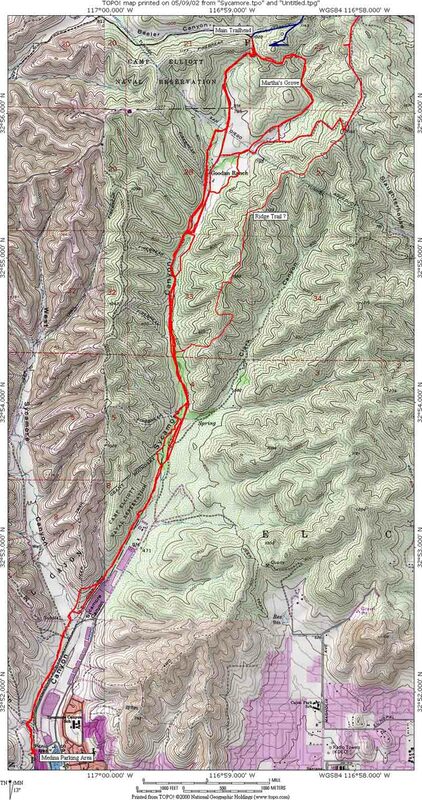 The north end of the canyon has the highest elevation so any trail heading south is mostly a gradual downhill. The northeast corner of the canyon is known as Martha's Grove and it has a really nice rolling single track running right through the middle of it. The valley runs north and south and so do most of the trails. Sooner or later all the trails run together so it is hard to get lost in the canyon. There is a more advanced trail known as the Crestline or East Ridge trail depending on who you are talking to. There is also an area just north of the canyon known as "Tip-Top" which adds some bonus mileage and elevation. Directions: There are three main parking options. The man trailhead is located at the north end of the canyon and medina is located at the south end. I have not used the HWY 67 option yet. MAIN TRAILHEAD - From I-15 exit at Poway Rd. Take Poway Rd. to Garden Rd. Take Garden Rd. East to Sycamore Canyon Rd. Take Sycamore Canyon Rd. south to the parking lot at the end of the road. MEDINA - NOTE: This trailhead location has changed since a fence went up in August of 2005 after some of the residents complained about trail user noise at the trailhead. From 805S or I15S take 52 East. Exit Mast BLVD. Turn left on Mast. After about 2 miles you will pass a school on your right, just after the school and within sight of the Medina traffic light, turn right into a dirt parking lot. The trailhead is across Mast Blvd from the parking lot. There is a trail that makes its way over towards the orginall trailhead heading west..
HWY 67 - There is also parking off of HWY 67 but I have not used it yet. 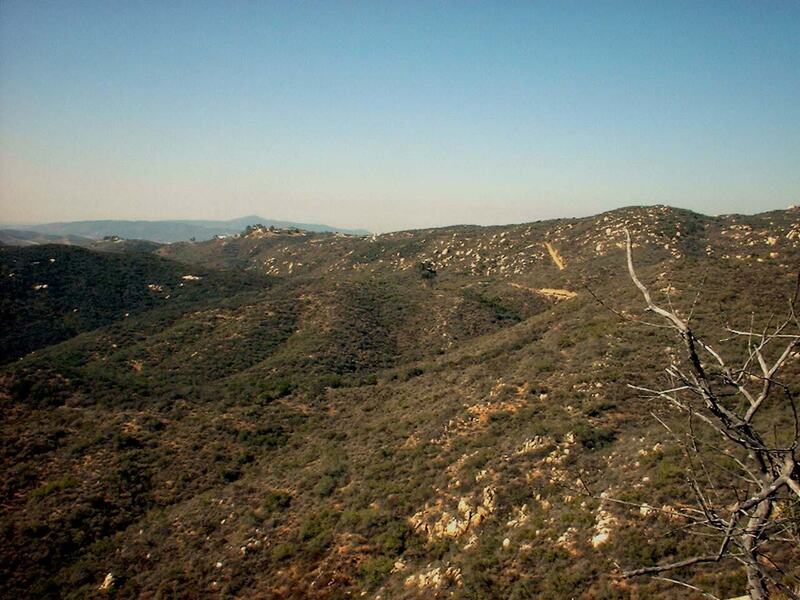 Check with the San Diego Mountain Biking Website for their directions. Hazards: This place could get really hot in the summertime. Ride Report from FEB 6th 2002: This was an afternoon hooky ride from the office. We blazed out of the office at lunchtime and headed for the trailhead at the north end of the canyon. It was exceptionally warm for a February day even by San Diego standards. From the parking we took a single track off to left of the parking lot as look down fire road that goes down into the canyon. The single track at this point was mostly scrub. This single track eventually took us down to an area called Martha's Grove. This is the area known as Martha's Grove. It was nice and shady here. There was a trail that headed west as well as one that headed south. We took took the trail that headed south. After some "trail and error" we ended up back at the trailhead. From there we took the main fire road down into the canyon and cruised down past the ranch house. We eventually went around a fence and continued south for a few miles before we turned around. On the way back we went along some single track that runs along the bottom of the west ridge. To the left is Mike Roach working a climb along the west ridge in February 2002. To the right is Michael Paul and Keith Ross working up the same climb in December 2004. Eventually the single track dumped us back on the main fire road north of the ranch house. It was getting close to quitting time back at the office so we took the main fire road back to the trailhead were a nice brewsky was waiting for us. My kinda day of work! Here is a link to a bunch of fire damage pictures on the Goodan Ranch Website. December 2004 - The canyon is recovering well from the 2003 fires with plenty of green grass covering the ground. You will certainly have plenty of views now as most of the trees are gone. The Martha's Grove trail now show some exposure that I really had not appreciated before. There has been some extensive work on the trail to control erosion but it sanitized much of the trail. Tip Top is a "bonus" section we typically do in conjunction with Sycamore Canyon. Once we get to the north end of the canyon at the top of Martha's Grove we leave the park on the paved road and hang a right on a dirt road maybe 150 yards of the road. About 2/10ths of mile up the dirt road you come to a gate. 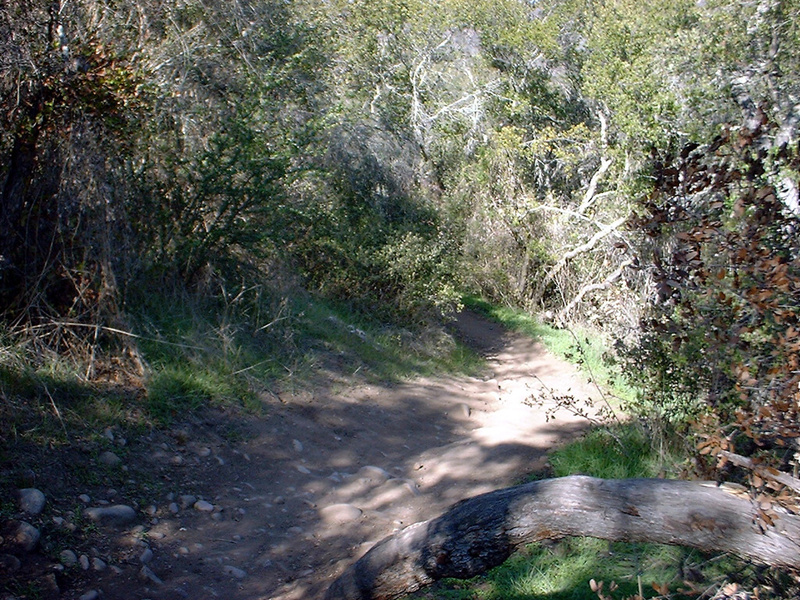 Go across the horse crossing and continue up hill as the dirt road is now in the "fire road" category now. At the first intersection, hang a left and continue uphill. You next turn will be a Y junction. Go to the right (you will be coming down from the left on your way back). From here we take the old fireroad uphill where it will dwindle down to a single track. You will eventually come up to a ridge top where you come to a T-junction with another singletrack. There is plenty of exploring to do up here, but we typically hang a right and follow the single track for a ways and then catch the first singletrack to the left and work our way back down the ridge. I'll try to get some better direction up once I do some more exploring in that area. The huge amounts of rain that Southern California has received during the winter of 2004 and 2005 has helped to speed up the rebirth of this place. These pictures do a very poor job of capturing the pure beauty of this place in this magically time of the year.